This site uses a DHTML floating menu, as well as the hyperlinks in the page content. You don't have to wait until senior year! What's New? My blog at jilcp.blogspot.com! Are you looking for a fine Raleigh wedding photographer, senior photos that you can't get from a "portrait factory", family portraits with an artist's touch, or a head shot that shows you at your very best? You've come to the right place. Find out what Classical Photography can do for you! 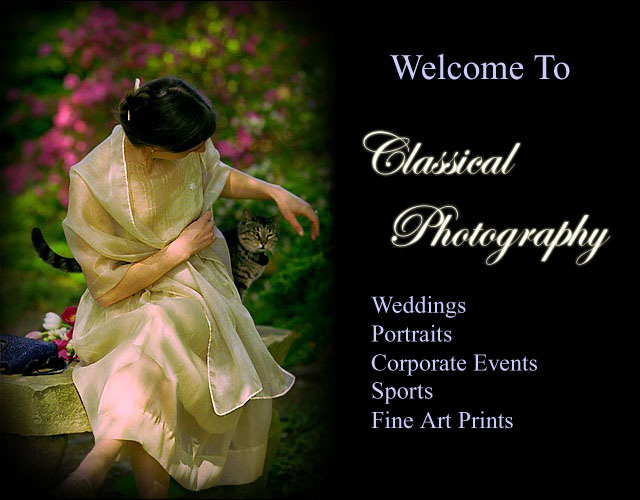 Welcome to Classical Photography of Raleigh, North Carolina, providing coverage for weddings and other special events, portraits for families and children, high school seniors, corporate publicity and other PR uses, as well as fine art prints for home or workplace display. From business cards to billboards. There are many photographers in the Raleigh area. Choose yours with care and you'll reap the rewards for many years to come. Jess Isaiah Levin, portrait photographer, wedding photographer, event photographer, your photographer! Photography Q & A - a bit about optics, digital terminology, etc. Bridal Portrait in "Olden Style"
High School Photo Albums - You don't have to wait until senior year! Squirrels Looking Chipper - not so many mosquitoes!